Begin by creating your spreadsheet and generating the chart or graph you will be working with. To follow using our example below, download Standard Deviation Excel Graphs Template1 and use Sheet 1. These steps will apply to Excel 2013. Images were taken using Excel 2013 on the Windows 7 OS. Click on the chart, then click the Chart Elements Button to open the fly-out list of checkboxes. Put a check in the Error Bars checkbox. 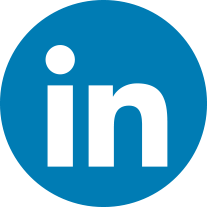 Standard Error – Displays standard error amount for all values. Percentage – Specify a percentage error range and Excel will calculate the error amount for each value. Default percentage is 5%. 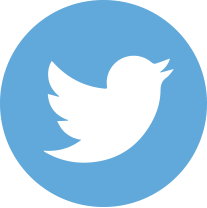 Standard Deviation – Displays standard deviation error amount for all values. Resulting X &Y error bars will be the same size and won’t vary with each value. You can also turn on Error bars from the Add Chart Element dropdown button on the Design tab under the Chart Tools contextual tab. 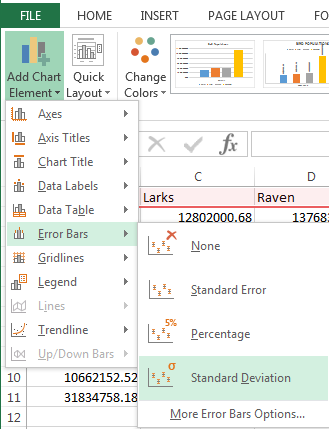 Blast from the Past: Error Bars function similarly in Excel 2007-2010, but their location in the user interface changed in 2013. 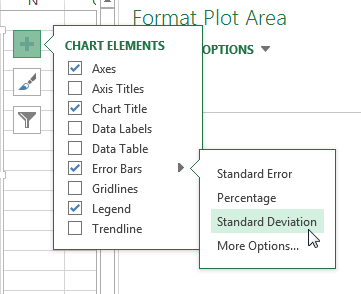 To find and turn on Error Bars in Excel 2007-2010, select the chart, then click the Error Bars dropdown menu in the Layout tab under the Chart Tools contextual tab. 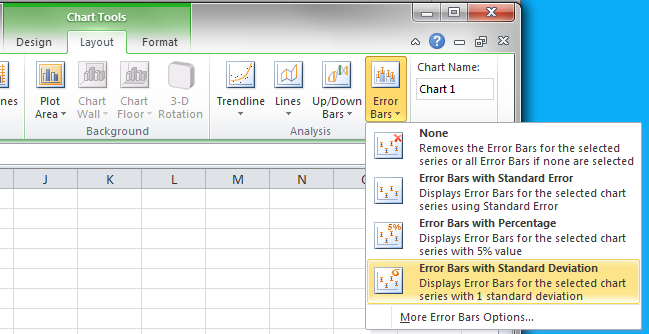 To customize your Error Bar settings, click More Options to open the Format Error Bars Task Pane. To follow using our example, download the Standard Deviation Excel Graphs Template1 and use Sheet 2. Set your error bar to appear above the data point, below it, or both. Choose the style of the error bar. 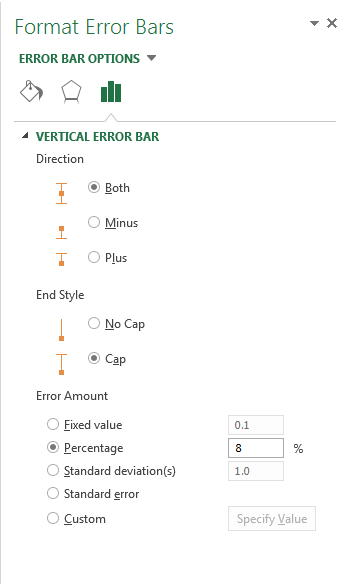 Choose and customize the type and amount of the error range. 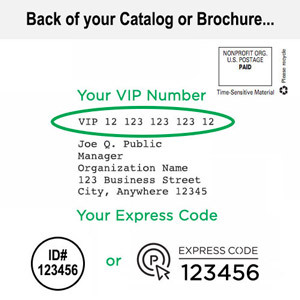 Select the type of error calculation you want, then enter your custom value for that type. 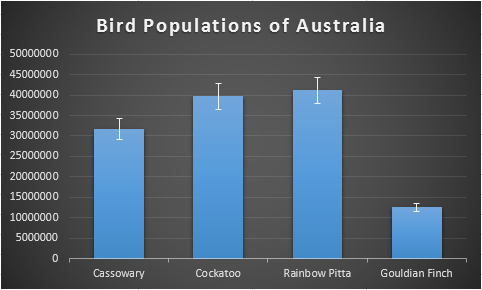 Bar chart showing error bars with custom Percentage error amount. If you need to specify your own error formula, select Custom and then click the Specify Value button to open the Custom Error Bars dialog box. In the dialog box you can enter an absolute value or a formula to treat all data points equally. Or, you can enter a cell range that contains an Error result that you need for each individual data point. In this over-simplified example, we selected B4:E4 cell range for both positive and negative error values. These cells contain a formula that calculates the error value based on a margin of error that is unique to each type of bird species. The resulting error bars, then, are also unique to each bar in the chart. The addition of error bars can help the statistician or researcher, or anyone working with complex data, convey their information with visual impact and clarity. I have 3 sets of data and I need to add standard deviation on any individual one. I appreciate any help. This will return the standard deviation for a group of cells. If this is a chart problem – you must define the STDEV() in the data if you want it charted. I would add it at the end (last column) and give it a different color in the chart. Thank you for the advice. I manage to specify all my standard deviation values. Very useful, thanks for your time! 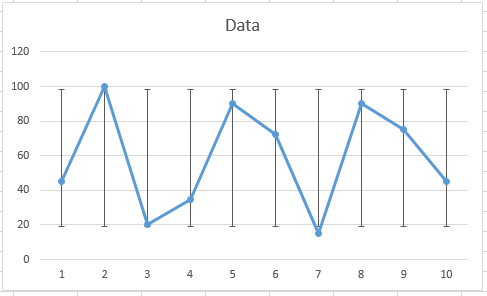 I am trying to add Error Bars in data based on standard deviation in Excel 2007-2010. I want to enter a cell range that contains an Error result that I need for each individual data point. I followed your example where I selected a range B4:E4 cell range for both positive and negative error values. These cells contain a formula that calculates the error value based on a margin of error that is unique to each type of value. The resulting error bars, should be unique to each bar in the chart. But when I select the range for both positive and negative values. The result is either no error bars on the chart or similar error bars for each value. Please help feeling frustrated. 1. Is the result in the formula cell what you expect? You must have two or more number arguments if you are using any of the STDEV* functions or the function returns a 0 which would not show error bars. In the provided example, you couldn’t just drop a standard deviation calculation into cell b4, for example, as it only includes one piece of sample data. 2. Is the scale of the chart causing a problem? 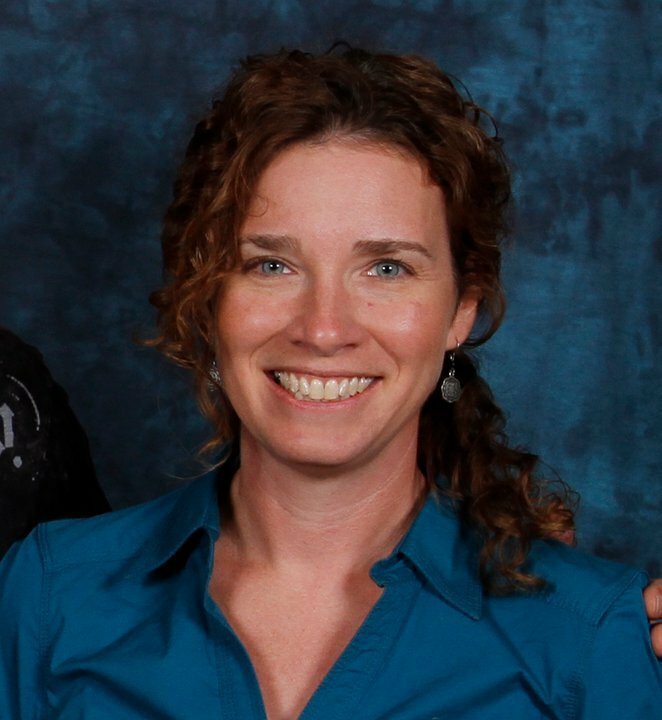 For example: do you have a very large number in your column and a very small margin of error? If your column represents 100,000,000 and your error is only 10, then the error bar would be very small in comparison and could look like it’s either missing or the same as the other bars. If your missing error bar shows as just a black line at the top of the column, this might be the case. HI, I have calculated the means and my std dev of my data points. 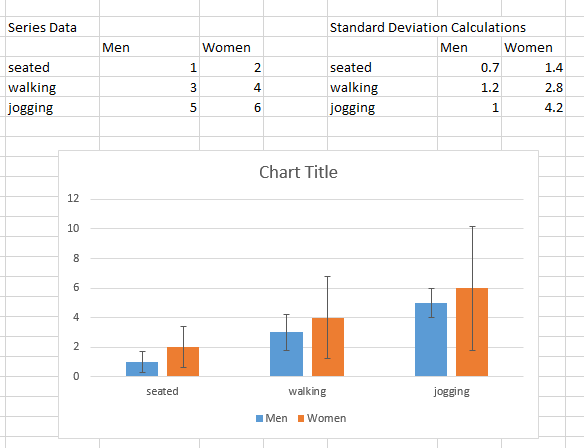 I have Males/Females as my x Coordinate and Seated/Walking/Jogging as my Y coordinates and created my double bar graph perfectly with 3 groups of males and females. When I add my std deviation bars in it selects all the men and all the women bars. I want to change each of the 6 bars individually for the std deviation of males walking, females walking, etc. Is there a way to do that? To specify a unique std deviation for individual data points in a series, you can use the Custom option. You will need to store your individual std deviation data somewhere in the workbook in its own range. 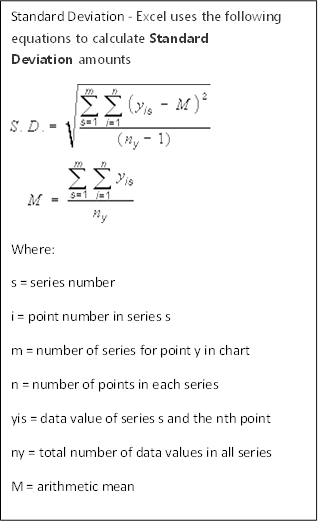 (see image below) Follow the directions in the paragraph beginning with “If you need to specify your own error formula” to assign your custom deviations to the data points in the series. (If your data has different positive and negative values, you’ll also need a column for that data.) Since you will be working with two series – male and female – you’ll have to perform the process twice, once for each series. Very many thanks for this. It was useful.